Murder by Gaslight: Murder among the Shantyboats. Colonies of shantyboats around cities the on the banks of the Ohio and Mississippi Rivers provided cheap housing for low income workers and unemployed transients. Shantyboats were just what the name suggests, handmade one-room shacks floating in the river. The colonies were densely populated, the boats were crowded, and they were often the homes of unsavory characters—conditions ripe for violence and murder. 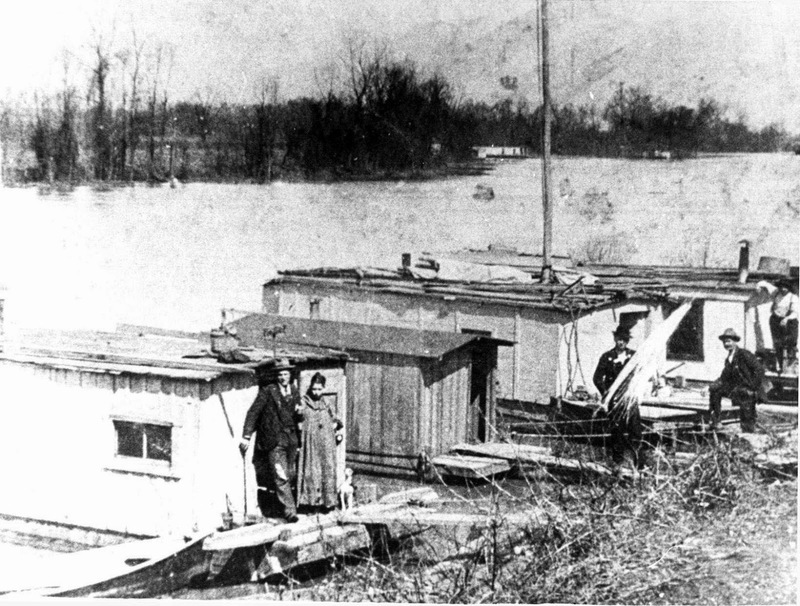 George Oliver and his wife lived with his mother and brother in a shantyboat on the Ohio River outside of Cincinnati until September 1883 when an arrest warrant was filed against Oliver for assault and battery and the couple fled further down the river to Coal City, Ohio. Two months later Oliver and his wife returned to Cincinnati by skiff to buy a shotgun and some ammunition. The Oliver family had an ongoing feud with the Allens who had a shantyboat nearby and when he returned, George Oliver learned that Thomas Allen had made some harsh statements against his mother. Oliver said he was going to “do Allen up” and leaving the shotgun behind, went with his brother Bill to pay Thomas Allen a visit. When Allen saw the Olivers he told them to leave and George refused. A heated argument ensued and Allen attacked George, grabbing piece of wood, and according to Bill Oliver, breaking it over his head. They began fighting then, rolling around on the edge of the river, with Bill Oliver and Mrs. Allen attempting to separate them. Allen was the larger of the two and was gaining the upper hand when Oliver pulled out his pocket knife and stabbed Allen in the neck. As Thomas Allen bled to death, Oliver and his wife left in the skiff. The police correctly assumed that the Olivers would head back to Coal City and went there to find them. When Oliver and his wife saw the police approaching, they got back in the skiff and started rowing toward the Kentucky side of the river. The police shot once, striking George in the hand but did not fire again for fear of hitting Mrs. Oliver. The Olivers made it safely to Kentucky and hurried inland to hide out. The police pursued them and at four a.m. arrested George Oliver at the home of his uncle, several miles from the river. They took him back to Cincinnati. 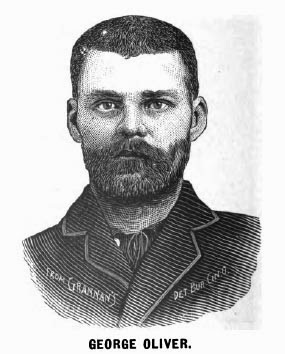 George Oliver was tried for murder in Cincinnati in May, 1884. His plea was self-defense but of the seventeen eye-witnesses who testified, only five took Oliver’s side and they were all members of the Oliver family. The real issue was premeditation. Major Blackburn, who defended Oliver, believed they had proven that Oliver did not go to Allen’s with the intention of murder, and expected a verdict of manslaughter if not outright acquittal. The prosecution thought first degree murder was possible but believed second degree most likely. But the jury surprised everyone; after deliberating all night they returned a verdict of guilty of first degree murder. This was the first murder trial in Cincinnati after the Courthouse Riots—several days of bloody rioting in 1884 triggered by a jury returning a verdict of manslaughter in a case where the public had expected a hanging. Oliver’s jury was, no doubt, influenced by this event and chose to err on the side of caution. Oliver was sentenced to hang on December 3, 1884 but the day before the scheduled hanging, Ohio Governor Hoadly commuted the sentence to life in prison. The governor had been besieged with calls to stop the hanging and the case had been argued before him twice. He finally agreed that Oliver was not guilty of premeditated murder. The fact that he had left his new shotgun behind implied that he had not gone to Allen’s intent on murder. The comment Allen had made the he would “do Allen up” had not been said to anyone in particular and had only been heard by one witness. Governor Hoadly had no doubt that Oliver had intended to fight and injure Allen but he had not planned to murder him. George Oliver served four years of his life sentenced before being pardoned on Christmas Day, 1888 by Ohio Governor Foraker. By this point, even the jury that convicted him was asking the governor for a pardon. But less than a year after his release, Oliver betrayed everyone’s trust and turned violent once more. In September 1889 he fought with Pat O’Brien at the Telephone Saloon in Coal City, stabbing him six times and leaving him in critical condition. Oliver fled to Kentucky and apparently was never captured. 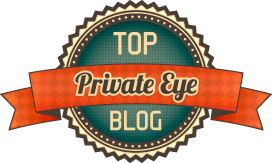 Grannan's Pocket Gallery of Noted Criminals of the Present Day. Cincinnati: Grannan Detective Bureau Co., 1889. "A Murderer's Break." Cincinnati Post 13 Sep 1889: 1. "Arrest of George Oliver." Cincinnati Commercial Tribune 4 Nov 1883: 4. "Breathe Free Air Again." Ypsilanti Commercial 28 Dec 1888: 7. "Columbus." Cleveland Leader 3 Dec 1884: 4. "Court Doings." 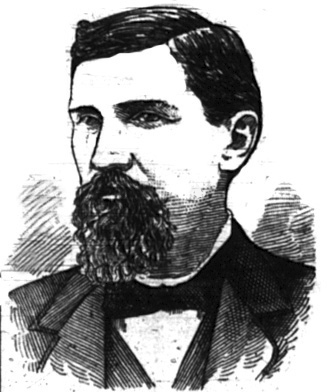 Cincinnati Commercial Tribune 21 May 1884: 6. "Getting Their Deserts." Cincinnati Commercial Tribune 1 Jun 1884: 13. A Secret History of American River People: History.